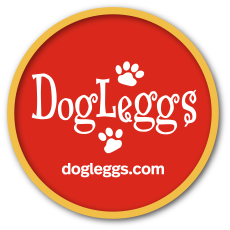 DogLeggs began with one dog suffering with a common yet difficult to treat condition, an elbow hygroma. Greif, a 10 year old Rottweiler had large elbow calluses and severe arthritis in both elbows. Greif then developed a hygroma in one elbow and the swelling extended down his forelimb to his toes. Greif's veterinarian suggested adapting a human kneepad or perhaps apply a padded bandage to his leg to protect his elbows from the hard surfaces he liked to lay on, although, he added, he had never seen either of these or any other attempt to pad and protect the elbows be successful. He further explained that once this condition is diagnosed it rarely goes away. A dog with a hygroma would have some sort of swelling the rest of his life. After much consideration the first pair of DogLeggs was created. Greif willingly wore his DogLeggs and just two days later the swelling was reduced by half. By the fifth day, the swelling was gone! Greif wore his DogLeggs full-time after that. As a bonus benefit, it was also discovered that the warmth and constant protection to his elbows, reduced Greif's discomfort from his arthritis and improved his mobility. Greif, who had not been able to make a one block walk without limping was walking without his usual limp and had a definite spring in his step. Soon Greif regained his interest in his tennis ball and interacting with other dogs, actually running and playing for the first time in two years! Greif's veterinarians were amazed! From there our product line has grown as the result of veterinary professionals looking for alternatives to traditional bandaging or solutions where none existed previously. In honor of Greif, every DogLeggs' product bears his paw prints with three toes on his left paw and four on his right. Our list of products continues to grow and we hope that you will find the product you need from the ones that are described on this web site. If your needs are not met by one of these products please contact us and we may be able to design a solution or refer you to one of our partners who can meet your needs. Thank you to the many thousands of customers that have trusted us by using our products. We derive great satisfaction from the many stories we hear from veterinarians and animal owners about each success from the use of our products.